Daily Mining Gazette/Kali Katerberg A section of damaged road is seen after heavy rains Friday morning in Hancock. 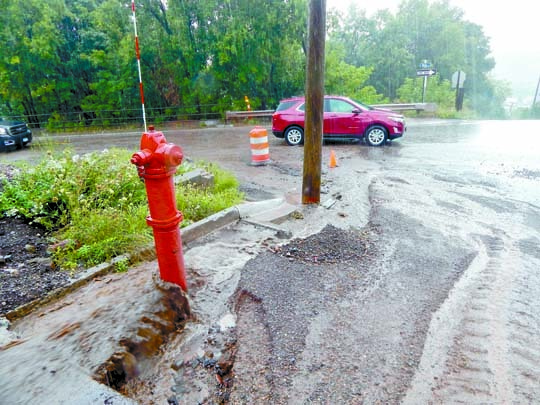 RIPLEY — Some Houghton County roads suffered minor damage Friday morning after brief, heavy rains that prompted a flood advisory. Most weather stations in Houghton County recorded between 1 and 1.25 inches Friday morning, said Jim Salzwedel, observation program leader at the National Weather Station in Negaunee. About 1.02 inches had been recorded at Houghton County Memorial Airport. In Hancock, 1.21 inches had fallen. A flood advisory was in effect for northern Houghton County through 3 p.m. Friday. The rain was caused by a trough of low pressure pushing in from the west, Salzwedel said. There was also a chance of thunderstorms continuing until Saturday morning. “By Saturday morning, a lot of that activity should be over the east,” he said. 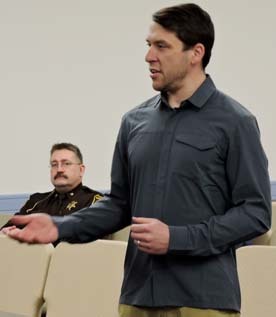 Houghton County Road Commission Crews found minor damage in a couple of areas, but nothing significant, said Road Engineer Kevin Harju. They’ve been out with inspection teams from the Federal Emergency Management Agency since Wednesday looking at damage from the Father’s Day flood. So far, Harju said, FEMA has concurred with the county’s measurements for its original submission. Their inspection of county roads should continue for another two weeks, he said. Harju said the inspection process has gone smoothly. Road crews are also busy trying to get restoration work done before winter. “Crews were out working today on repairs, and will continue working 10-plus hours, five days a week to try to catch up,” he said. Following heavy rain Friday morning, patched roads once again washed downhill in Hancock. Additional portions of Elevation Street were blocked off due to rain water erosion. City Manager Glenn Anderson estimates repairs since the Father’s Day flooding have cost the city around $200,000 with more repairs and cleanup needed after each heavy rain. “We’re trying as best we can to proceed with repairs of Elevation Street,” said Anderson. FEMA began inspecting sites in the city Thursday and Friday, though some areas like the Swedetown Trails may not happen until next week. The city is waiting to hear back from FEMA on how many of the 79 projects will be deemed eligible. 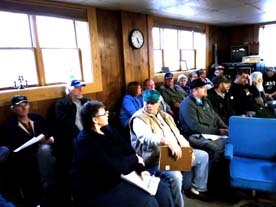 Houghton Clerk Ann Vollrath said a Department of Public Works survey of the roads had found no additional damage from the flooding. “He was out looking all day long, and he didn’t find any issues caused by today’s rain,” she said.